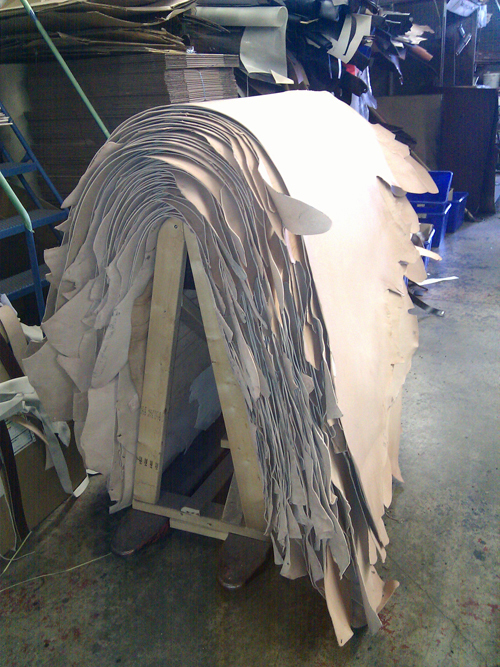 We purchase leather hides tanned in the USA and process them into finished hides suitable for the style of radio case we will manufacture. Our process is intended to be as environmentally friendly as possible. The resin that seals and colors the hides is water based, with no volatile solvents. The top coat finish is also water based and we use drying racks rather than gas heaters used by the tanneries to cure the finish. Although we use mostly black leather, we can match almost any other color required. The final step in making quality leather is the plating process. We have a 250 ton Sheridan press to impart a uniform pattern on the hides that blend any imperfections into a smooth, finished product. We also offer custom finishing for other manufacturers and can perforate upholstery leather for auto upholstery. Our testing lab uses Satra technology to confirm our leather meets our highest standards for quality. We "rub test" to 10,000 rubs so our leather will stand the test of time.